The occasional mid-flight tipple has been a mainstay of airline culture since we first took to the skies for commercial flights. Some people have been known to take it too far, true, but the actions of a few shouldn’t kill the enjoyment of many, and so the practice continues. 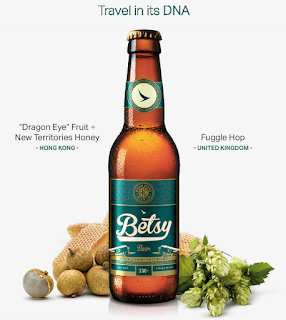 This year, Cathay Pacific, the airline operated as part of the Swire Pacific Group, looks set to further the association between alcohol and aviation with the launch of Betsy Beer (not to be confused with the famed American producer of a similar name). Named after the airline’s first ever aircraft and described by the company as “the world’s first hand-crafted bottled beer specially brewed to be enjoyed mid-flight”, the beverage has been created in partnership with Hong Kong Beer Co. with the intention of better appealing to customers’ tastes both at altitude and on the ground. They say this was necessary due to the way in which cabin pressure and altitude can affect the taste buds, significantly altering our perception of food and drink consumed while travelling by air by ‘dulling’ our sense of taste by up to 30%. In the case of some particular ingredients, the flavour can be changed entirely. By creating a wheat-beer designed to ‘heighten the senses’ with enhanced flavour and aroma, and reducing bitterness as compared to highly hopped beers, the company claims that their new creation has none of these issues. They also opted to keep the beverage unfiltered and increase carbonisation by 10% in order to stimulate flavour receptors and ‘create a sensory experience’. Infusing the beverage with flavours derived from Dragon Eye fruit, British Fuggle hops and New Territories honey, Cathay Pacific claim to have created “the ultimate traveller’s beer”. Cathay Pacific’s general manager for marketing, loyalty programme and CRM, Julian Lyden, said, “We know that when you fly, your sense of taste changes. Airlines address this for food in certain ways. But nobody has ever tried to improve the taste of beer at altitude. That seemed like a great opportunity for us to help our beer-loving passengers travel well. Betsy Beer will be available on flights between Hong Kong and the UK from March of this year, and will also be available for purchase in Cathay Pacific’s airport lounges within either of the aforementioned countries.